Movember cofounder Adam Garone describes how to grow a massive charitable community by bringing the fun. Adam Garone never thought a silly beer-fueled bet to grow a mustache would turn into a multi-million-dollar global charity and the largest non-governmental funder of prostate cancer research. Seven years later, Movember expects more than 600,000 men to ask their friends to contribute donations in exchange for growing an artful caterpillar lip in the annual Movember mustache challenge, which starts Nov. 1. “The main driver for people participating in Movember is because it’s fun,” says cofounder Garone, who has meticulously trimmed guilt-laden messages from their campaign in favor of irreverence, a slick barbershop-style web design, and two blow-out parties that bookend the month. As Movember has grown from a hobby to a movement, Garone says he’s learned to create out-of-the box evangelizing strategies for Movember newbies or cut large checks without personally overseeing performance. Indeed, Movember packs in all the trimmings of a good time. 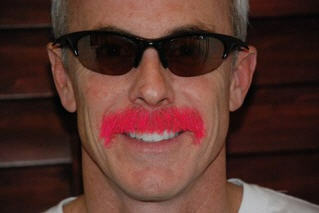 The fundraising website is a sea of silly profile pictures (like from the 2010 Mo Mo Award winner, pictured here, who sports a neon pink mustache). The annual “Moscars” YouTube video competition garners some impressively professional-looking submissions from eager shavers looking to win the top prize of premium razors. In addition to about 60 official parties hosted around the world, Movember supplied around 10,000 MoBros and MoSistas last year with a party in a box, complete with award sashes and prizes to honor the most dedicated and creative mustaches. Behind its party-hearty exterior, Movember has created a sophisticated, organized process that makes messaging and coordination easy for participants. Despite the popularity of social media, Garone estimates that 75% of team donors are recruited through email. 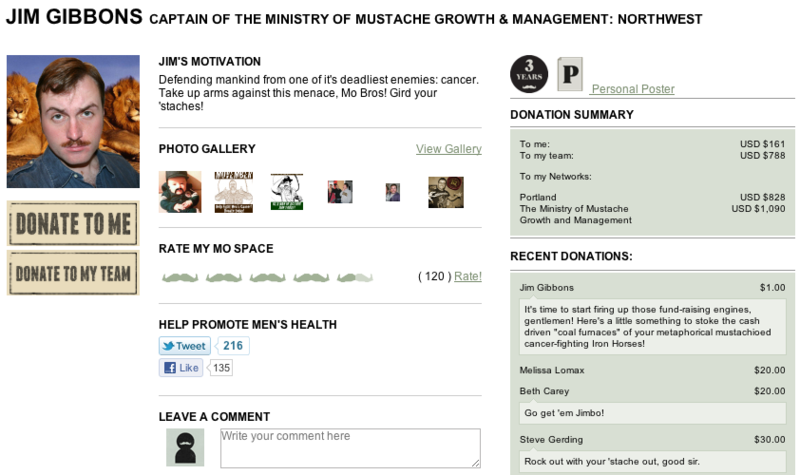 “We spend a lot of time trying to make everyone’s life when they’re participating in Movember as simple as possible,” says Garone, who designed Movember.com for easy integration with social media, lots of downloadable content, and, perhaps, most important, scripted letters to help participants ask for donations via email. The central website serves as a all-in-one dashboard for coordinating activity: Participants can organize teams of fundraisers, style their “Mo Space” with clever pictures and jokes, demonstrate their fundraising progress, and encourage supporters to share the campaign for social media friends. “For us, it’s all about participation, and really the funds come off the back of participation,” says Garone, who says Movember prioritizes the volume of members over concentrating on big fundraisers or celebrities. An estimated 30% of peach-fuzzed participants won’t even raise a single dollar, and Movember is explicit about not coercing them into minimum fundraising goals. The all-inclusive approach has discovered an unexpected gold mine: girls. “While it’s a masculine brand, the girls are actually the most important part of this, because they make up a majority of the team captains and 65% of the donors,” Garone said. Girls, for obvious physiological reasons, can’t chase the Movember dream of matching Hulk Hogan’s famous trucker ‘stach. But they can participate as “captains” who help organize and spread the word about fundraising. The web strategy has been so successful that it has caught the attention of Google, which just released a brand-new commercial with Movember as the star. As one of the biggest prostate cancer funders in the world, Movember’s mission is maturing into one of industry-wide influence, outlined in their Global Action Plan. “The biggest learning,” Garone says, was not to simply cut checks to cancer foundations. “We’ve taken far, far more control,” he says, in the hands-on management and influence of Movember’s sizable purse. Like other mega-philanthropists we’ve written about, Garone wants researchers and organizations to work collaboratively. “Movember is absolutely uniquely placed to smash up the rules and bring them all together,” he says. Author Greg Ferenstein is taking the Movember dive! Follow him as he grows his first mustache.